Today I found out how the Himalayas formed. The Himalayas, which stretch some 2,900 kilometres between India, Pakistan, China, and Nepal, is the world’s tallest mountain range. In addition to Mount Everest, the world’s tallest mountain by peak elevation standing at 8,848 meters tall, the range also features several other mountain peaks over 8,000 meters. It is the only mountain range to boast mountains over 8,000 meters—the runner-up is a mountain range in South America, whose tallest peak is just 6,962 meters tall. Millions of years ago, these mountain peaks didn’t exist. The Asian continent was mostly intact, but India was an island floating off the coast of Australia. Around 220 million years ago, around the time that Pangea was breaking apart, India started to move northwards. It travelled some 6,000 kilometres before it finally collided with Asia around 40 to 50 million years ago. Then, part of the Indian landmass began to go beneath the Asian one, moving the Asian landmass up, which resulted in the rise of the Himalayas. It’s thought that India’s coastline was denser and more firmly attached to the seabed, which is why Asia’s softer soil was pushed up rather than the other way around. The mountain range grew very rapidly in comparison to most mountain ranges, and it’s actually still growing today. Mount Everest and its fellows actually grow by approximately a net of about a centimetre or so every year. That’s in comparison to the Appalachian Mountains, which developed some 300 million years ago or more, which is actually decreasing in peak elevations as it erodes. The continued growth in the Himalayas is likely due to the Indian tectonic plate still moving slowly but surely northward. We know the plate is still moving in part because of the frequent earthquakes in the region. So what happened? In part, the rate of vertical growth has varied over time, including in favor of more horizontal growth. And, of course, gravity and erosion having limited the mountains’ growth significantly. India merging into Asia became the accepted theory about how the Himalayas were formed around 1912. That’s when Alfred Wegener, a German meteorologist, came up with the “Theory of Continental Drift” which gave us our first ideas about Pangea, tectonic plates, and the thought that continents were moving away from or closer to each other. What does the future for the Himalayas look like? Undoubtedly, the mountains will continue to grow, though at the same time eroding too; but the net is expected to continue to grow as the Indian tectonic plate doesn’t look like it’s going to slow down any time soon. That means more earthquakes and, over time, slightly taller mountains to climb. In the last century, the east coast of the United States has moved about 8 ft. further away from Europe. The fossils of sea and coastal creatures can still be found in the Himalayas, as it was once two coast lines that merged together. These fossils not only provide evidence that the Himalayas once existed on a coastline, but also information about climate change and plate movement. The name for the Himalayas comes from the Sanskrit for snow and dwelling: “him” and “ālaya” respectively. Essentially, the home of the snow. Mount Everest is named after one of the Surveyor Generals of India, George Everest. It was not, however, Everest who first survey the mountain, but Andrew Waugh who took over the role of Surveyor General after Everest. Waugh thought it would be a good idea to name the mountain after his predecessor. Everest didn’t like the idea, but he was overruled and his name was eventually adopted for the mountain by the Royal Geographical Society in 1865. While Everest is generally considered the tallest mountain on Earth because it reaches the highest elevation, some argue that this should not be the measure used, but rather the tallest from the base to peak. In that case, Hawaii’s Mauna Kea would be the tallest at about 10,200 metres from its base on the ocean floor to peak at 4,205 metres above sea level. Sir Edmund Hillary and Tenzing Norgay, his Sherpa guide, became the first people to successfully climb to the peak of Mount Everest in 1953. Before Hillary, several dozen attempts had been undertaken to climb to the peak since 1921. Since then, nearly 3000 people have accomplished the same feat and around 200 have died trying. The Himalayas serve as a “climatic divide” as well as a physical barrier between India and the rest of the continent. They prevent cold winter winds from entering into India in the winter, making India warmer than other regions along the same lines of latitude at that same time of the year. Similarly, they prevent the southern monsoon winds from taking moisture across the border to Tibet; the result is India gets far more precipitation than the relatively more arid Tibet. The Himalayas are home to some interesting creatures: clouded leopards, Asiatic black bears, tahrs, and langurs to name a few. Snow leopards and brown bears have adapted to live at higher elevations. Unfortunately, due to human interest and interference, many species that call the Himalayas home are dying out, such as the Indian rhinoceros and the Kashmir stag. While you might not think the icy mountain peaks of the Himalayas that you see in photos would be conducive to growing much of anything, the little hidden valleys of the Himalaya range are actually depended upon for food production. Farmers grow apples, cherries, grapes, oranges, pears, almonds, walnuts, tea, and a variety of herbs and spices in and around the range. 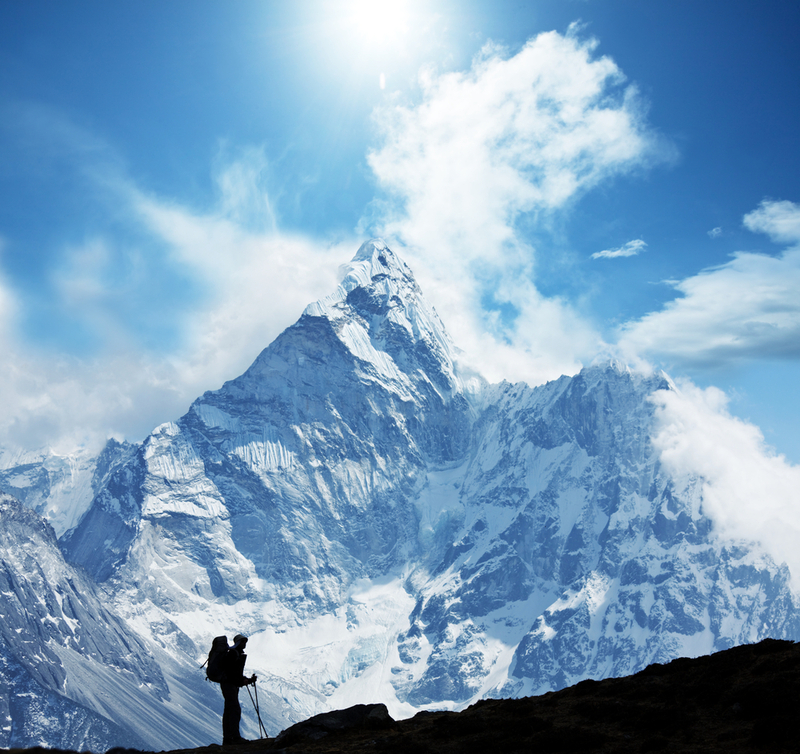 The Himalayas are notable not only for their size, but for their structure. The Himalayas are considered fold mountains as they consist of a series of jagged peaks that are mostly parallel, as though they have been folded over and over again. They are also home to deep ravines, glaciers, and rivers, forming a complex and treacherous range. How do YOU pronounce Himalayas. Some people say Himal ay as (stress on the ay) while others say Him al yas (stress on the al). He – maa – layaa – this is how it is spoken Sir. I have some knowledge of Sanskrit as I am a Hindu. Actually it depends upon someone’s speaking and purounciation. During the collision of continental plates the vast majority of mountain building occurs deep below the base of the orogenic belt. Much like icebergs, with only the tip showing above water, mountains develop roots through subduction and isostasy to allow the crust to maintain equilibrium. In the case of the Himalayas (to answer Douggie – I pronounce it both ways but I understand the “posh” way is considered the more accurate rendition) the depth of rock below the mountains is 155 miles, compared to the mere 5.5 mile height of Everest. Sorry, but wikipedia is not a reliable source anyone can change it if they have an account and .com websites are not very good either because they get paid to run the site. That as to be hard to do. And K2 at 8,611 metres in the Karakorams? This explanation is correct, but it was actually the Indian and Eurasian plates that collided, and then the Indian plate went below the Eurasian plate and since there was pressure on the Indian plate from the Eurasian plate trying to go under it, and formed a structure called a fold mountain, which is what the Himalayas is. Good, and at the same time, extremely disgusting, to see people who are themselves not related to India in any way, trying to define what’s “posh” way to pronounce!!! Next, the shape of India shown in the figure is absolutely wrong. Looks like again some Pakistan-friendly person is trying to get Kashmir away from us, and forcing people to believe that’s natural. Lastly – Yes, K2 is at 8611m, and it is also a part of the Himalayan mountain ranges. Also, the Himalayans Range is consistently growing, so these Earthquakes are bound to happen, whereas, the 2nd best (the one in South America), is dormant. Sandy Destenser Clemens, Kashmir has always been part of the Indian cultural zone of the Indian subcontinent but geographically, most of it isn’t part of the Indian plate. indian plate broke off from africa not australia. very fundamental mistake. Very interesting!!! Highest peak belongs to Indian territory but named by Non-Indian Surveyor’s last name.